Goddess of grain, harvest, and growth. God of the sea, rivers, floods, and earthquakes. God of war, bloodshed, and violence. Virgin goddess of the hearth, home, and chastity. God of music, arts, knowledge, and healing. Virgin goddess of the hunt, wilderness, animals, and childbirth. God of boundaries, travel, language, and writing. God of wine, fruitfulness, festivals, and ecstasy. Goddess of reason, wisdom, and intelligence. God of the underworld and the dead. Wow!! You are an expert of Greek Mythology! Phenomenal!! You are an expert of Greek Mythology. Only 2 in 96 Americans aced this Test. You must be curious and diligent. You make knowledge your own, and you enjoy new patterns that emerge from old ideas. In Ancient Greece, you would have been praised and regarded with nothing but utmost respect. Keep it up. You are a genius!! Failed :( You sure could use a Greek touch-up! 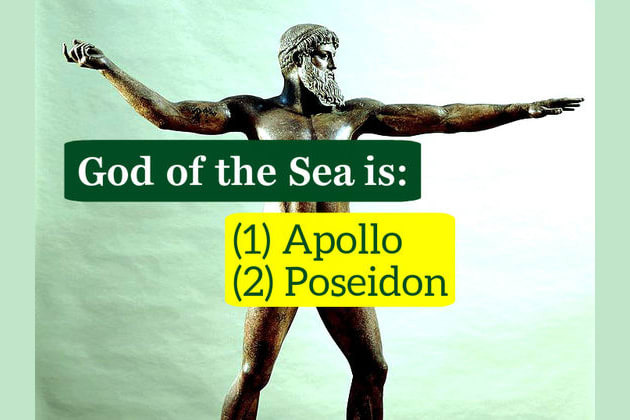 You failed the Greek Mythology test :( Try again, and share the quiz with your friends. Test everyone with this Greek challenge. You are a genius if you can get 17/17.